Easy way to view a folder of JPEGS. Is there a better alternative to Multi-Thumbs? Is Multi-Thumbs really the best app in Image Editing category? Will Multi-Thumbs work good on macOS 10.13.4? 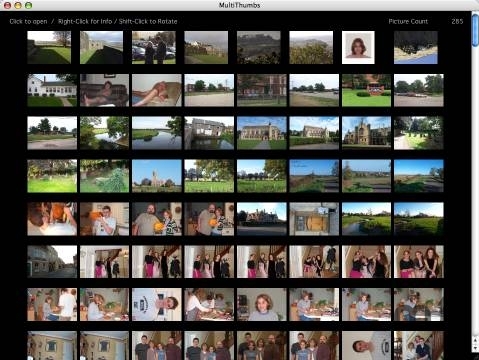 Multi-Thumbs creates a full page of Thumbnails (similar to iPhoto) but doesn't make you create albums. Very simple: open a folder with pictures in it, it creates thumbs. You click on a thumb and it shows a full screen picture, click on the picture and it's gone. Does a few other things, but primarily it's a quick easy way to view a folder of JPEGS. Similar to my other program, ThumbNailer, but with a full page of thumbs and without all the other features, this is simple and clean. Multi-Thumbs needs a review. Be the first to review this app and get the discussion started! Multi-Thumbs needs a rating. Be the first to rate this app and get the discussion started!